Get "10 Disaster Recovery Essentials" | PC.Solutions.Net . : We make nets work! :. 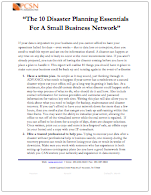 Every business owner should read this report to avoid costly mistakes that most businesses do not recover from after a disaster. In this report you’ll learn the 10 essentials you need to have in place to be able to recover in the event a disaster strikes. Remember, most businesses do not recovery after a disaster and usually shutdown.